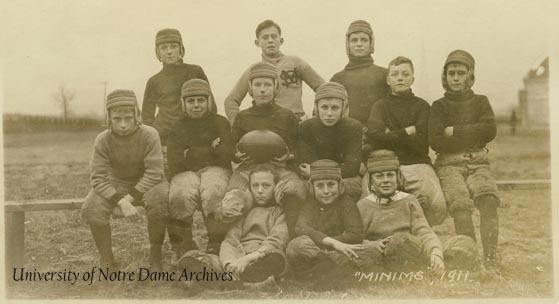 For nearly ninety years, Notre Dame consisted of three departments: Senior (collegiate, ages 17+), Junior (preparatory, ages 12-17), and Minim (grammar school, under the age of 12). 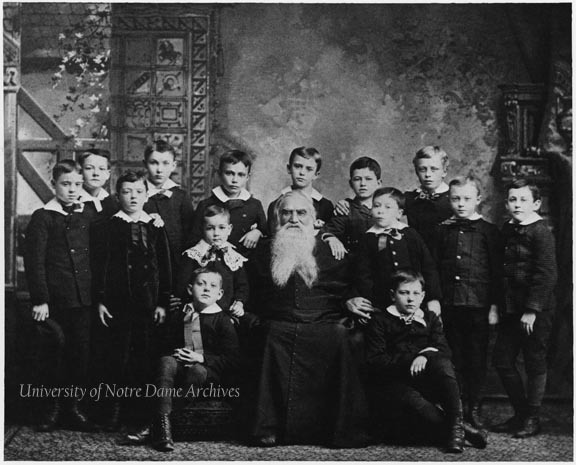 It was possible to arrive at Notre Dame at the age of six and not leave until after graduating from the Senior Department at the age of twenty-two. Or, as in the case of Jimmy Edwards, some never left. For some years, the University Bulletins listed the ages of students enrolled at Notre Dame [see the Student Index]. The earliest age listed is Roscoe Clarke of Denver, Colorado, at 3 ½ years old in 1893. Lay women were in charge of the education and care of the Minims until the Sisters of the Holy Cross took over in 1863. During the 1860s-1870s, the number of students in the Minim Department generally hovered around thirty to forty students. With growing numbers, St. Edward’s Hall became their home in 1882. 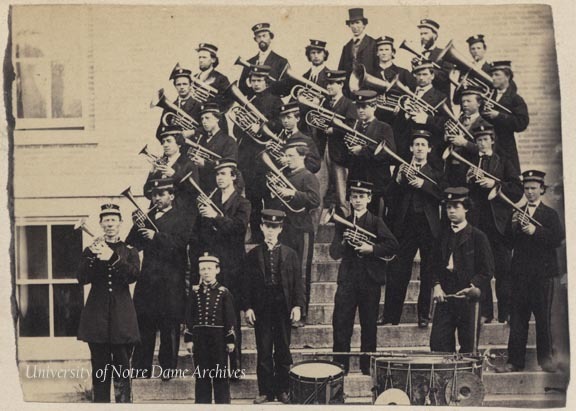 In 1883, the number of the Minim Department finally reached an enrollment of one hundred students and was the cause of much celebration at Notre Dame. With no coincidence, the celebration was planned for November 24, the forty-first anniversary of the arrival of Rev. 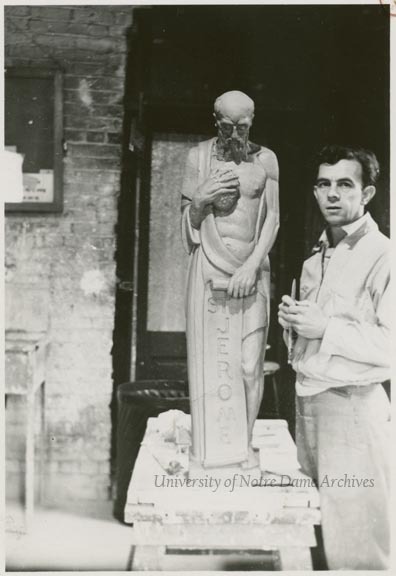 Edward Sorin, CSC, at Notre Dame. Fr. Sorin looked fondly upon the boys and their accomplishments and enthusiasm. He often spoiled them with special treats such as oranges and candy and they heartily honored Fr. Sorin on Founder’s Day. The three departments of students at Notre Dame operated mostly independently of one another. However, on such a small campus, they were quite aware of each others’ activities. In 1867, its first year of publication, Scholastic had the following comments about the Minim Department: “They are now fully organized, and apparently depend on none of their Senior associates except for regular meals, which they continue to take with the Juniors. … [O]therwise they have literally nothing to do with the other students. They would not allow anyone to infringe upon their grounds or rights… They are at times rather a noisy little nation, especially since music is taught them upon their own premises; the splendid piano which as been placed there for their exclusive use, is seldom silent” [Scholastic, 09/21/1867, page 4]. Teasing the Minims on their favored status with Fr. Sorin, the author of the column joked that if the boys acted up, they could be sent to another boys school in Indiana. 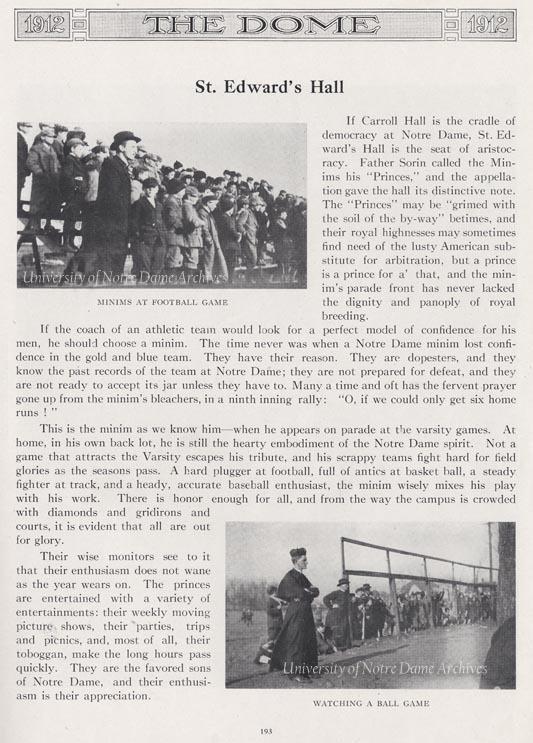 Sports and physical activities played an important part in all of the students’ lives, and the Minims were no exception. They played most of the same sports as their older counterparts, including football, baseball, and track. They also held gymnastic expositions and participated various races around campus. They had their own play halls, fields and equipment. However, the Minims often proved to be valiant opponents against the Junior Department and area teams such as South Bend Junior High. With the influence of the vision of Rev. 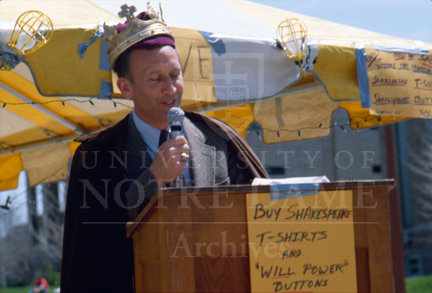 John Zahm, CSC, Notre Dame began to move toward the more modern model of a university at the beginning of the twentieth century. This modern plan did not include boarding schools for boys. The Junior Preparatory Department was eliminated in 1922 and the Minim Department ended in 1929. Upon the closing of the Minim Department, Scholastic issued this parting tribute: “No more will [St. Edward’s Hall] be the haven of the youngsters who have been in such close touch with the University since the beginning of its existence. No more will the Sophomore Hallers be treated to the sight of aspiring embryonic All-Americans staging their gridiron battles on the Minims’ field. The school has been done away with; the Sisters have taken up their work in other parts of the country; and old Brother Cajetan who had charge of St. Edward’s is dead.” [Scholastic, 09/20/1929, page 10].